I watch sunrise then drop off the last mountains and into civilization. The trail melts into a faint dirt road as it flattens out into the valley. The road fades in with each step, becoming more defined until it solidifies into a paved single lane through the outskirts of a village. The route becomes a patchwork of stitched together paths, trails, roads, and sidewalks. A long curve of road pushes me into the grass every time an oncoming car passes. I climb over, under, and around fallen trees that crisscross a dirt track. In the middle of them, I run into an Italian man and only understand the word “disastro” as he motions to a trunk hanging across the trail at chest height. I nod and crawl under it. I think I’m lost when I expect to cross a freeway on the map then realize it is underneath me somewhere, buried in a tunnel through the earth. Two old horses look at me as I walk past their stable. 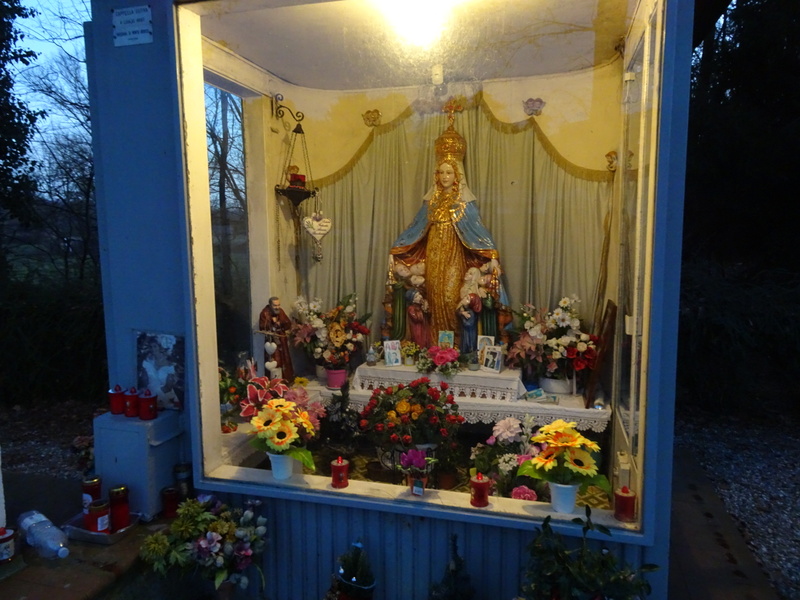 I sneak across a highway between racing cars and stop for a moment by a roadside shrine to the Virgin Mary. There are a lot of shrines now along the roads and trails, tucked away in corners, growing more common with each step closer to Rome. Some are no bigger than shoe box, others are small buildings. This one is stuffed with flowers and photographs and glows with electricity as night falls. I use the light to fish my headlamp out of my bag then I disappear down a dirt path to find a quiet spot in the woods for the night. Posted in Europe North to SouthTagged ENS, Europe North to South, featured, hiking, Italy, Po, shrinesBookmark the permalink. D. Google maps doesn’t know where Monte Motta is but I’m assuming it’s between Turin and Milan as you come down into the Poe Valley. We were in Italy in October and found the Italians to be friendly and cordial. Lots of beautiful churches and yes, shrines to the Virgin Mary. Are you heading to the French border? Safe travels. Namaste. Bets are on as to which way you ill head from here…more mountains to the West? The edge of the Mediterannean? It’s not like you to take the easiest path, but sometimes one needs a break! Are you listening, Daniel? Again, your fans are ever hoping for a book from youir travels…all of them!!! I love your descriptions of the areas you walk through say so much about the culture that imposed all these human effects on the natural landscape…canals, dirt tracks, castles, road systems, villages, cities, lights, and now shrines to the Virgin Mary.